PhotoClub enables your BlackBerry® as a funny make machine with photos! 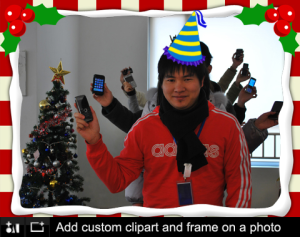 It includes Adjust Photo, Add Clipart, Add Frames, Add Effect and Add Custom Elements these useful and funny functions. Due to more than 5000 users’ nice feedback, and more than 10000’s giveaway, we ended the giveaway campaign, be so KIND to understand this, it’s a deserved app for you.We will keep on updating to serve you. Lightweight and functional. Popular Photo Tools takes several times LESS MEMORY on your device than other photo editing apps!!! CROP works seamlessly both on touch screen and track pad, ideal for Torch. To resize the crop box either use the pinch functionality on your touch phones or use the track ball/pad. Move the box around with the track pad, press the track ball/pad once to select the area, increase or decrease the size of the selection using the track ball/pad. Press the track ball/pad again to finalize selection. iGallery allows you to play photo slide automatically. Turn your BlackBerry® into a digital photo frame! You can customize the play period. Password support. Make sure your phone has security. PixTrix for BlackBerry® is a simple to use app that allows you to apply photographic filters to your photos and share them with your friends. Pick from a selection of predefined filters and make adjustments to the Brightness, Contrast and Saturation of your images. Link the app to your Facebook profile and directly upload the altered photos to your profile or alternatively save them back to your photo album on your phone. Your BlackBerry® takes great pictures and you use it all the time to record the happy moments in your life. What if you want to recolor your picture, maybe make it sepia or black and white and then share it with your loved ones? Hmmm…that’s a hard one! PhotoNote lets you take photos with notes. You can use it to share ideas with friend and colleages. It is also useful as a visual todo list or photo diary. Use as a visual todo list. For customers who want access to their photos on-the-go, the new ground-breaking Black’s Photo app, designed by TELUS, will provide just that. The Black’s Photo app offers a mobile way to manage, share, store and print photos, allowing users to immediately share their memories with friends, family and colleagues, rather than sending them at a later time when the moment has passed.